GARDEN ANYWHERE - Love to garden but don't have the space? The Mindful Design LED Indoor Herb Garden will bring your dream garden indoors. Perfect for offices, bedrooms, small apartments, or for when the weather outside is too harsh! SUNLIGHT SIMULATING LED - The bright, 850 lumen, 4000k LED simulates natural sunlight, encouraging healthy plant growth. AUTOMATIC SMART TIMER - LED light features automatic 16hr on, 8hr off mode so you never have to worry about turning the light on or off - the work is done for you. GROW ANY TYPE OF PLANT - No special seed pods or extra equipment is required; grow any seed or plant you wish, as long as it fits! 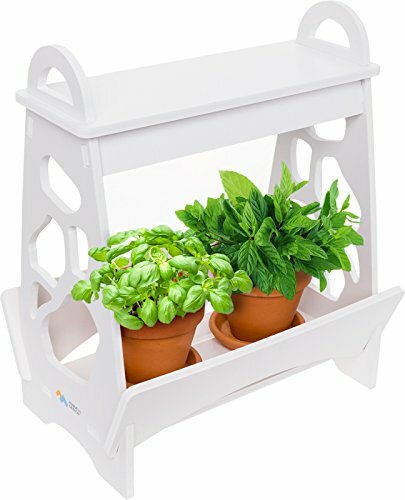 Ideal for growing everything from fresh herbs, to leafy greens, vegetables, or even flowers. The possibilities are endless! PRODUCT SPECIFICATIONS - Planter measures 14" L x 8.2" W x 16.5" H; pots, seeds and plants not included.